Making a good first impression is so important! Before I became a full-time blogger, I worked in public relations & marketing, and a little bit of crisis management. My past and current roles are different from one another, but one crucial part remains the same: I meet new people at various events (and sometimes in different cities) on a regular basis. Meeting new people isn't the hard part, but making sure you make an impression can be. And I'm not saying I'm a master at this yet, as I'm constantly learning and trying my best to better myself. However, I have had several instances when I successfully establish really solid professional relationships and friendships after the first meet! This may sound or appear old-school, but trust me, it makes a difference! The chances of people remembering your name is a lot higher when you give out your business cards as you introduce yourself. And when you have really nice business cards, it tends to be a good conversation starter, too! About three months ago, I founded a story-telling boutique influencer marketing agency called Once Upon. 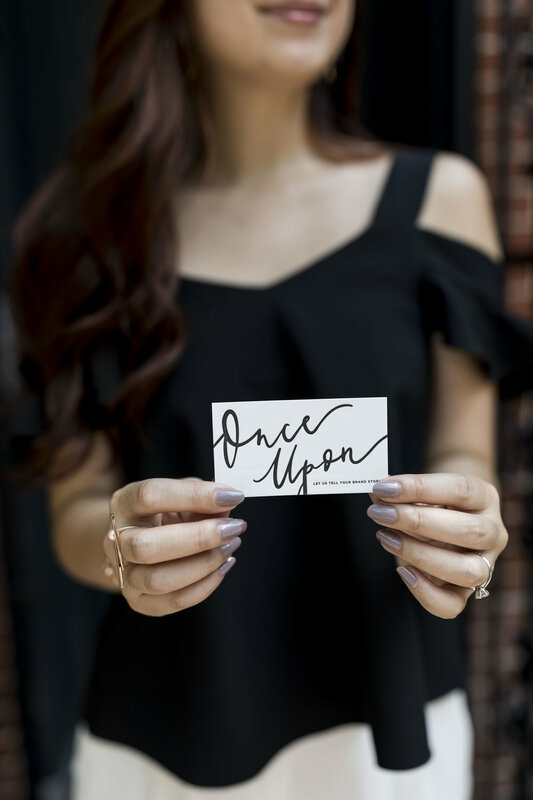 Based in New York City, Once Upon offers companies outside of the U.S. an opportunity to establish a brand presence in the North America region through social media and influencer marketing. The agency supports the teams by offering tailor-made campaign ideas and reach out to suitable, and reliable, influencers. Only recently I got a chance to produce business cards for Once Upon. I wanted the cards to look professional and feel "weighty," because I believe the traits would reflect on my company! 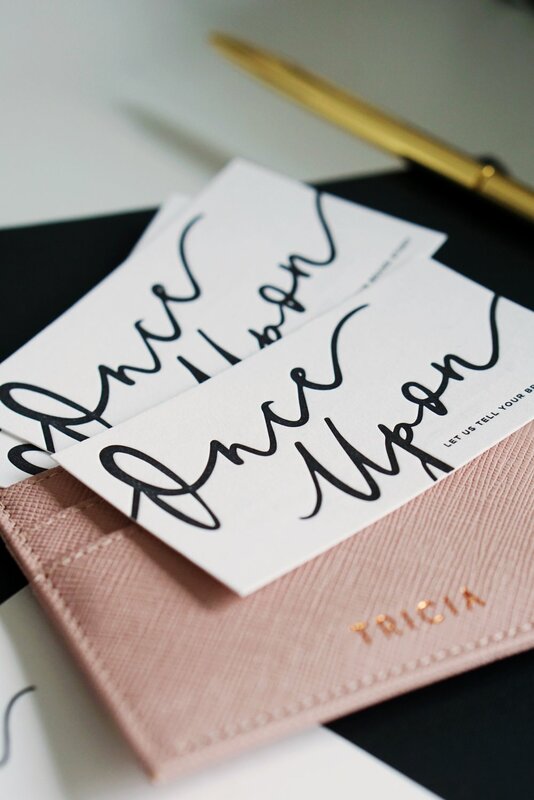 So I asked the talented team of designers at Carda & Co. to help me create my business cards. The quality of the cards is so, so amazing. The paper they've chosen for me is very fine, and I love the texture. On one side, you can see Once Upon's logo, which was designed by Olea & Fig, and the company slogan, too! On the other side, they place the focus on my name and listed all the important information in a clean and simple manner. Note: If you are an influencer interested in working with brands represented by Once Upon, sign up at the bottom of this page. Once Upon's logo was created by Olea & Fig; photo by Ashley Gallerani. Carda specializes in designing and printing high-quality paper goods. Remembering someone's name sounds plain and simple, and very matter-of-fact, but I know it can be difficult for some people. The trick for me is to say the person's name a few times during the conversation. But of course, in a natural way, because you don't want to appear awkward either. What I usually do is to repeat the name right after the person introduces him or herself. "Hi! It's really nice to meet you, Grace!" When I ask the person a question, sometimes I would say the name again. "So Grace, what do you think of the event so far?" And when the conversation comes to an end, I would do it again when I say bye. "I will see you around, Grace; it was really nice chatting to you!" I've come across people who have forgotten my name despite having actually met 3, 4 times in person already. And to be honest, I understand people forget sometimes, but there's a point where it just becomes rude and unprofessional, which definitely isn't a good impression you'd want give to anyone! If you say "yes, let me connect you with that person" or "let's grab coffee soon," then be sure to follow up and actually do it! A lot of people make these empty promises, so when you actually make a point to go through with them, you may actually stand out amongst others! And it's not even that difficult! With fellow blogger and now close friend Lisa from @stylevoila. Hajra from @hajra_aaa and I before attending an event. Stay true to yourself and just be who you really are! I really think this makes a big difference because there is no way one person can be fake forever, right? So if your goal is to build long-term relationships, then the only way for that to be possible is to be authentic! I once met someone who told me about how much she loved a certain brand and the style of their collection but at another event, she was agreeing to someone else who was completely belittling the designer's work — she obviously has forgotten about what she said the week before! And I think that made her seem less genuine to me. I like to send a quick email or leave a message somewhere to say hello to the person again to help them really remember you before the day ends. I hope you enjoyed reading this post! Thank you for stopping by! Find out why writing a letter to your future self is one of the best things you can do for yourself!